This morning mother nature treated us to a rare sight ... a flock of snow geese bobbing in the waves. Through the years we've occasionally seen these regal fowl flying along the shoreline in their migration north. This is the first time we've ever seen them in the water. There is a strong wind from the northwest. I guess they got tired of flying headlong into it and decided to paddle north for a bit. I kept waiting to take a photo of them taking off the water, but they just kept paddling. Finally, I've gotten to the machine quilting for the mountain lake piece. The pine trees are done in three steps. 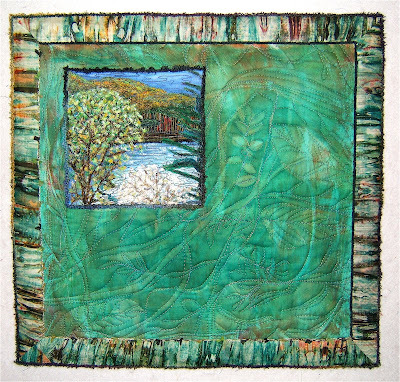 The first quilting is done on the foremost trees and the top edges of the dark green forest with a lively variegated mix of greens. I dropped down from those top edges to add spots of brightness here and there. The second round of quilting filled in the dark green forest with a variegated thread that is a blend of greens that nearly matches the fabric. The third round of stitching is done on the trees up in the mountains with a variegated blend of muted green, gold, and rust colors. I stitched varying sizes of zig-zag patterns since these are pine tree forests of the Rocky Mountain National Park. All the top threads are King Tut by Superior Threads and bobbin thread is Bottom Line ... also by S.T's. The free-motion quilting is done on a Brother Nouvelle 1500S. I very much want to love this machine, but the overly sensitive tension settings drives me nuts. Do any of you have this model? Do you have any tricks to maintaining an even tension? Both the top and bobbin tensions change while I'm stitching ... aargh! Tomorrow I tackle the mountains and sky. I was the fourth contributor to Susan of Spokane's "Flower Power" themed Exquisite Corpse piece. My work blends into the edge of Arlee's section, but hardly into Susan's. Aargh! I wish I had been more attentive to that edge. It's now up to Susan to meld our work together. I used my "ortwork" collage technique. I constructed it separately from Susan's whole piece. It consists of silk flowers, "bits & pieces", and roving collaged over a hand-painted background fabric plus a thin layer of batting. Tulle netting and free-motion quilting holds it all together. A bit more quilting secures it to Susan's large piece. I have had the experience of being among such an array of wild flowers on a sunny blue skied day and have definitely felt their "power" ... I just collapsed and didn't want to leave. Go here to see Susan's photos of the whole piece on Flicker. Go here to read Susan's reveal and description of the whole piece as well as posts about the whole Exquisite Corpse Project. A very small box from Susan in Spokane arrived in my postbox about a week ago. It was stuffed full of marvelous art making materials. There are wonderful hand stamped papers and fabric, a length of fun yarn, a hank of roving, fine copper mesh pieces, interesting beads and a pair of beautiful wooden earrings. Susan is a fellow corpse-mistress and a contributor to my Exquisite Corpse piece (center section on the right side). Soon photos of individual parts and my thoughts about the whole piece will be posted. I'm thinking some of those goodies from Susan will end up on the finished piece. By the end of the day, Tuesday, there were six birds from my pattern adding to the flock at large. Five are pictured here ... the sixth one flew home with its maker, Helen. My husband's two cousins and their wives were visiting the cottage for a few days. My friend, Helen, came to spend the day playing in the studio with us. Just before Helen left I took this photo of her and the cousin's wives birds. My bird had not progressed very far during the day due my hostess duties and helping each of them with unfamiliar machines as well as some of the steps involved in creating their birds. Poor thing had no feet, wings, nor eyes. By the end of the day he got his cow bird wings to become the MaCowCowa bird. He found his roosting place on the ledge above the wood-burning stove in the living room. My husband and I created the tile mosaic in 1999 to make a fire proof barrier for the heat generated by the chimney. Elvis is peering out of the top of Big Red, the lighthouse. If you'd like to add to the flock at large in the world, the pattern and instructions are downloadable PDF files that you can print. They are found here (pattern)and here (instructions). To see a lot of other birds and more instruction photos click on the "Birds" label at the end of this post. If you make a bird, please share it with me. I was the fourth of six contributors to Vero's Exquisite Corpse Fairy project and had chosen the center space on the unworked side. My work is rarely populated with recognizable forms whether human or mystical, but it often features flowers. So hiding a fairy among flowers was the most natural and easiest choice for me. Creating the fairy was experimentation and play. I drew several versions of her. The chosen one's outline was traced onto freezer paper. I cut away her form to get an outline of her face and shoulders. The waxy side of the paper was ironed onto a piece of hand-painted silk. A flesh colored oil stick pastel was used to shade her skin. I ran the pastel across the rough surface on a piece of paper, then used a stiff bristled paint brush to pick some of it up to color the skin area exposed within the freezer paper template. I kept applying the pastel until it was built up enough to be seen against the background. I used a permanent pen to draw her facial features. If I were to do this again, I would use a light brown ink rather than black. However, black is what I had at the moment. Then her wings were traced from my drawing onto the silk with that same pen. I ended up painting them with a mixture of silver and white acrylic paint plus Gloss Medium to make them shimmer. Yarn, roving, and thread form her hair. Days before Vero's piece arrived in the mail I had purchased a stem of silk hydrangea flowers just because it was so beautiful. I loved the multiple range of coloration within the flowerettes. A few of those were scattered around the fairy along with free form leaf shapes cut out of various batik fabrics. The centers of the flowers are made with "balled up" strands of silk and cotton threads. A few Angelina strands were sprinkled overall. Tulle netting was laid over all and it was machine quilted with just a thin layer of batting. Vero's background was a wonderful piece of linen that I didn't want to completely cover up. I cut away excess background from my piece around the outside edges and attached it to Vero's corpse with more machine quilting. The irregular edge gave opportunity to my fellow creators to fill in the dips while the extended pieces could interact with their edges. Go here to see and read about Vero's whole piece. Go here to read about the various contributions to this other Exquisite Corpse pieces. 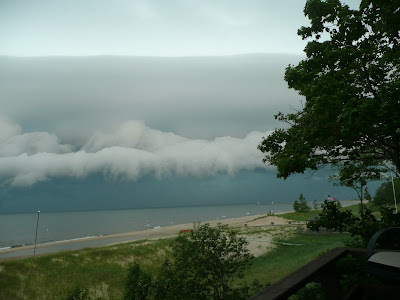 There were rain storms and high winds coming off the lake up through 7:30 this evening. The bright sunshine at the horizon brought me to the livingroom window. I took the above photo from that window. Stepped out the door and took this one less than a minute later. By the time I got down the steps and the path to the deck overlooking the beach this part of the world was treated to a glorious sunset. I love the horizon clouds reflected in the big shoreline puddle that is created by the extraordinarily high water table in the ground. Every once in a while I have a concern that some of my lake series quilts are too colorful. Sunsets like this are a confirmation that they're not "over the top" unrealistic ... that my memories and feelings about the lake are grounded in real moments scattered through many years of visual experiences. Those big thunderheads in the distance will most likely bring more severe weather during the night. Time for an extra blanket. Last night even just a sheet was too much cover. Since we had arrived a week ago today, there have been the strangest weather systems coming from the west across the lake. There most definitely are a few lake series quilts that will result from the tremendous storms we've experienced. 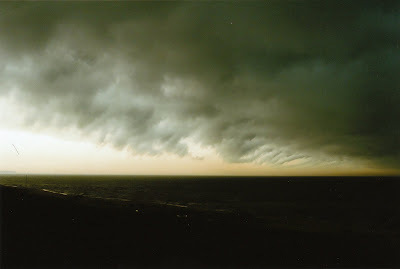 Several of us took photos trying to capture the magnificence and feeling of this approaching storm on Sunday. Our son, Kemper, was the most successful with his new, wide angle digital camera. There was much lightening in this fast approaching rolling wave of clouds. Of the many shots taken, this is the only one that captured a streak. At the point in the photo below we vacated the deck overlooking the beach with a fast retreat into the cottage. We thought surely there would be water spouts (tornadoes over water) dipping down from these rolling cloud banks, but we didn't spot any. 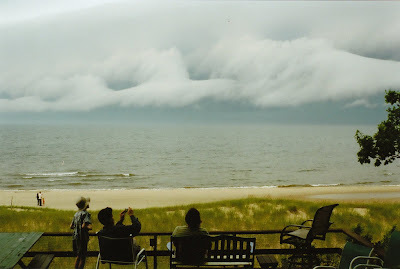 Soon after getting inside the cottage we were under the edge of that storm. It took about twenty minutes from the time we noticed that strange bank of clouds on the horizon until this point. This photo was taken that same Sunday morning after the huge thunder storm the night before. 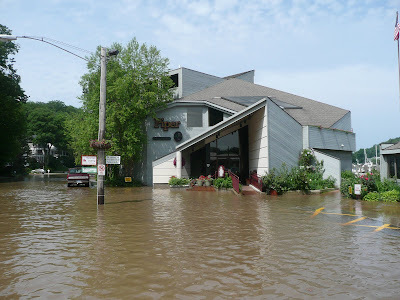 The inner lake that connects to Lake Michigan via the channel with the big red lighthouse had flooded the road. My husband has been coming here for over seventy years and has never seen this phenomenon. Once in a while there has been a big puddle over one side of the road, but never a flood. It has rained in every twenty-four hour period since we've arrived. The temperatures have varied greatly, too. One minute it's so hot we can hardly stand it. The next we may be looking for sweaters, socks and long pants to keep warm. I just finished getting my studio in order and machines set up. I may even get some work done on the mountain lake piece today. But first, I've got to go find some socks and put on a sweat shirt. Exquisite Corpse Round 1 "What is a Weed?" Arlee's dangling appendages presented a challenge to work around. I figure they serve to push my flat area more into the background. After all, weeds can hardlty be noticed growing in the hard dirt where nothing else will sprout. The plants in this piece are actual weeds that I had picked along a rocky bed of a stream in Colorado. They were pounded with a flat river stone into a piece of muslin. That was done several years ago and the natural dyes had faded so I used crayons to give them color. I heat set the crayons to melt the wax and pigment into the fabric. A fusible web was ironed on the back before I cut them out and adhered them to the background fabrics. 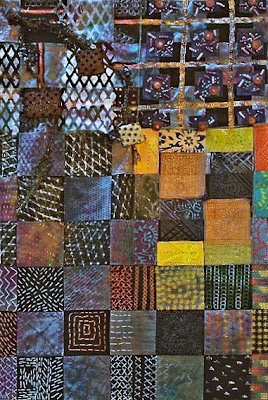 The ground fabric is textured from a crayon rubbing over a cut wood surface from the same area. It is over painted with fabric paint. The blue sky is a piece of hand-painted fabric. A dark green tulle netting is layered over the whole area. A piece of batting provided by Julie is sandwiched between my piece and her background fabric. I machine quilted with black thread to outline as well as to define the weeds. Seed stitching by hand quilts the ground and sky to add a bit of texture. I had fun! I'm glad that a bottom square was left open for me. The dirt serves as a base or ground for the whole piece ... or at least this bottom corner. I like to think that I would've thought of a different composition if my space to fill had been in the middle of the quilt. and the forest fire trilogy. Bits and pieces were stitched directly on the background fabrics. In the full grown forest in the above piece there are three layers of complete trees. That's a lot of stitching that distorts the base fabrics. So, I came up with another method that surely I'm not the first to discover. It begins with cutting trunks and branches. Laying them in basic tree shapes on a sheet of water soluble stabilizer that has been lightly misted with a spray adhesive. To add leaves, I cut thin strips of many colors of green fabric and snipped bits directly onto the stabilizer. I let them fall "wherever". I kept building up branches and trunks and lots of leaves. Then laid another layer of water soluble stabilizer on top. It also had been lightly misted with a spray adhesive. That "sandwich" of tree pieces was heavily stitched making sure that all lines of stitching crossed a number of times to ensure that all of these tiny pieces are connected. Click the photo to see a close-up of the stitching. I used a Microtex needle and Superior's polyester thread ... smoke in the top and clear in the bobbin (because I have more clear than smoke). I slipped a plastic bag over a cutting board to give support to the lacy trees while I ran water over it to dissolve the stabilizer. I set the nozzle to a light spray to more easily wash away the sticky stuff. I patted it dry with paper towels while it was still supported by the cutting board. It was easy to pick up and lay on this plastic grid to dry flat. I've made several batches of scrub trees and bushes for the foreground shore of the mountain lake piece. That is the first project I'll work on when I get to Michigan. We are packing up the Elvismobile and our projects and machines to head north on Thursday. If you see a red SUV pulling a smallish black trailer plastered with Elvis "stuff" through Tennessee, Kentucky, Indiana, and Michigan give a honk and a wave. Next week I'll be back to post the results of those newly constructed trees. By then I may have thought of the best way to stitch them to the quilt top. I'm open for suggestions. Three quilted trading cards were made for Susan, Arlee, and Vero who have added their creativity to my Exquisite Corpse piece. You may recognize the elements from "Come With Me to the Kasbah". I had previously sent ATC's to Caroline and Julie who also added their skills and imagination to that piece. Caroline's got in the mail before I thought to take a picture of it. Here's both sides of Julie's. My Exquisite Corpse piece will be presented here with close-up photos when it arrives in the mail from Canada. The last two mailings from there to here have taken sooooooo long ... nearly five weeks for one and two+ weeks and still counting for this one. Is it the gas prices? Customs? What?